Whew! Brown trout fishing out of Oswego Harbor COULD NOT be any hotter. The Fish Doctor went in the water April 10 and our first charter trip was April 18. 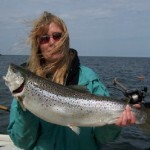 On the 18th Fish Doctor anglers boated somewhere between 30 and 40 trout and salmon, mostly browns, but along with them shallow lakers, cohos, rainbows, and one Atlantic salmon. Ditto on our second day. The next two days a fisheries research team fished with us to tag browns, lakers, kings, and Atlantics. It’s an exciting new tagging study designed to track tagged fish for a year, constantly recording the temperature and depth. Despite spending time targeting Atlantics, which we knew would be few and far between, we still boated almost 25 fish per trip and tagged a sample of shallow water lakers and browns. The tally for our first four days of fishing was somewhere around 120 fish, or an average of about 30 fish/trip, the largest browns 31 1/4 inches and the largest laker 13 1/2 lbs., were all taken on ultralight tackle. Conditions could not be better for early spring fishing in the Oswego area, with the water temperature of the Oswego River as high as 49 degrees in recent days, but the lake water temperature just outside the plume of the river 35 degrees . We’re talking a magnet in this area for baitfish and the trout and salmon predators that follow them. With flow of the Oswego River still pushing 20,000 cfs and the water entering the lake still turbid, conditions could not be more ideal, and good inshore fishing should continue thru early June. 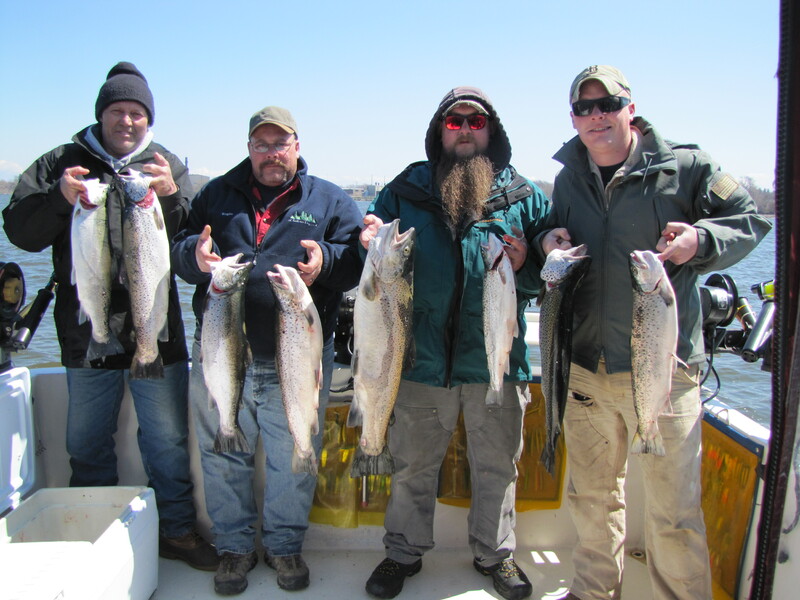 The 2010 Lake Ontario salmon and trout charter fishing season started off with a bang this year with a few Atlantic salmon over 10 lbs. and some smaller 20″ – 21″ fish caught in Mexico Bay. With summer like temps in early April, more than normal of boats were on the water, and started seeing some nice browns. The first trip of the season for Fish Doctor Charters was a short shakedown cruise on 4/20 followed by our first 2010 charter on 4/21. Dave and Don, two old verterans and skilled lake trollers in their own right, joined me for an 8-hour AM trip. As we pulled out of Oswego Marina just as light started to crack the eastern horizon, I looked at my Fish Hawk surface temp and it read 57 degrees…, unbelievable for April. Flow in the Oswego River had been low at 1,000 cfs for some time, and the water had very little color to it. I figured fishing would be hot and heavy the first hour or two…, wrong! After the first hour and not a nibble, all I could say to Don and Dave was, “Hmmm…”. Then things started to happen, and action was steady in and out of the harbor until about 11:00 AM for browns up to 10.6 lbs. on my Epson digital scale, domestic rainbows just shy of the 21″ size limit, and two landlocked Atlantic salmon, both less than the 25″ size limit. 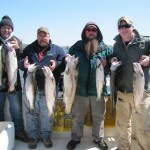 The fishing was good, but what we learned from our first two trips was verrryyy interesting!!! First, the browns, rainbows, landlocks and one coho we caught were pot-bellied and in top condition. They had obviously been feeding heavily on something. The past few years their primary April forage has been gobies because smelt have been scarce, and alewives had not moved inshore to spawn until May or June. In April some years, browns have foraged on gobies almost exclusively. I always clean and package my party’s catch onboard before returning to the dock, giving me a check of the stomach contents of our fish. What I saw when I gutted the browns was not solid gobies, but smelt in good numbers, lots of 3″ -4″ yearling alewives, a few 6″ – 7″ adult alewives, lots of spottail shiners, and a few gobies. No wonder those browns were so fat…, warmer than normal water temperatures that activate browns and a diversity of all the forage they can eat! These are perfect conditions for maximum growth of browns, with 3-4 lb. April browns probably reaching 5-6 lbs. or larger by September. The other thing we noticed…, not one single brown, rainbow, Atlantic, or coho had a single lamprey attack mark…, not a scale missing. This compares with the past few years when almost every single larger brown, 3-years old or older had been hammered by lampreys, and even some of the smaller 3-4 lb. 2-year old browns had been attacked by lamprey transformers, 6-12″ lampreys, fresh out of the rivers. Lampreys may kill their host, in this case trout and salmon, if a lamprey is large enough and a fish is small enough, and the lampreys remove too much fluid from the fish’s body. If a lamprey doesn’t kill the fish, the loss of body fluids, retards their growth. Either way, lampreys are hurting the fishing. Secondly, lampreys seem to attack brown trout and lake trout more than other species like steelhead, and studies have shown they select a larger fish to attack and feed on. Both of these factors spell troube for big browns. The more lampreys, the higher the mortality of brown trout and the poorer the survival of the larger trophy browns. This is why in the last few years in eastern Lake Ontario we have not seen the numbers of brown trout larger than 15 lbs. that we used to see in the ’80′s and ’90′s. Let’s hope what we’re seeing is real, not just an April blip on the lamprey radar screen, and we have fewer lampreys this season, which means more and bigger brown trout. The browns we’ve been catching on our first few trips have been hitting standard gear, mostly stickbaits and spoons fished on boards and riggers. Silver/blue Flutterdevles and ham. silver/ brass 44 Suttons have been our hottest spoons. The SB90 Megabait, especially in the Kiro Kin finish have been the best stickbaits. As for location, we haven’t had to leave the area around Oswego Harbor, but browns are being caught east of the harbor off Four Mile Point, where the warmer water of the Osweg River sweeps along the shoreline. West of the harbor the water has been gin-clear with visibility to 20′ or more and fishing has been tough. With the high winds we’re getting today, 4/27, and tomorrow(predicted), 4/28, there will be a lot of colored water west of Oswego Harbor, which should produce some good fishing there. If you’re fishing colored water in the sun, fire tiger and clown Smithwicks or other stickbaits with a little color usually work well. Ditto for spoons, i.e., the lemon lime Flutterdevle, Bitterlemon MI Stinger, etc.